India has been holding ceremonies to mark the first anniversary of the tsunami which hit its south-eastern coast and the Andamans Islands. In the southern state of Tamil Nadu, a memorial column was unveiled in the worst-hit district, Nagapattinam. More than 6,000 people in the district died in the tragedy. The huge waves claimed the lives of thousands of people in the Andaman and Nicobar Islands, and left thousands of others homeless. Residents of Nagapattinam observed a minute's silence at 0917 local time (0347 GMT), the exact time when the killer waves hit the shore. The district's top administrative official, collector J Radhakrishnan, opened a park with 6,065 saplings, one for every person who died in the disaster. 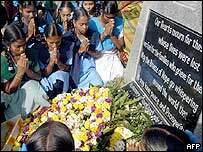 A memorial pillar was also unveiled, where children orphaned in the tsunami placed wreaths. "Most of us want to study well and get away from fishing," R Omsri, 14, is quoted as saying by AFP. Special prayers were held in churches in memory of those who lost their lives. The BBC's TN Gopalan says for many, life is still far from normal. Many fishermen say they are still scared of going out to sea. The state government has handed over more than 1,000 fully constructed houses to those who lost their homes in the tsunami, but many more still need to be built. Some residents complain that they have not received the aid promised by the state government. In the Andaman and Nicobar islands, groups of people walked from village to village in silence, in memory of those who lost their lives. On the island of Car Nicobar, the Indian military unveiled a memorial to the more than 100 air force personnel who were killed when the tsunami overwhelmed an air force base. "I die each morning when I wake up," Lieutenant Colonel N Chakravarty, who lost his wife and two daughters, told AFP. Many of the people who died on the islands were tribal people, and there have been complaints that the aid sent from the mainland is both inadequate and unsuitable.